A portrait of Elton Raymond and Nora Helen Allen with their children. Family members are identified as (left to right) front row: Elton Raymond Allen and Nora Helen Allen, back row: Donald, Harvey G., Martin W, William Boyd, and Raymond B. Elton and Nora Allen lived and farmed northwest of Soldier, Jackson County, Kansas. A portrait of Elton Raymond and Nora Helen Allen with their children. 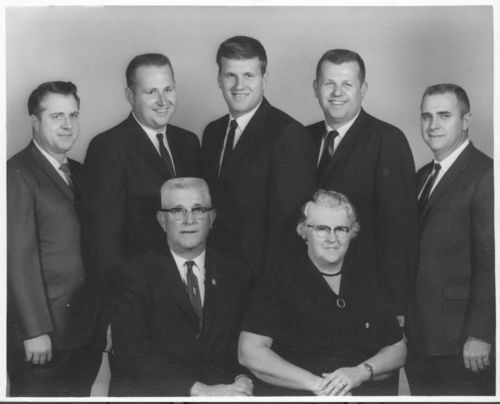 Family members are identified as (left to right) front row: Elton Raymond Allen and Nora Helen Allen, back row: Donald, Harvey G., Martin W, William Boyd, and Raymond B.
Elton and Nora Allen lived and farmed northwest of Soldier, Jackson County, Kansas.